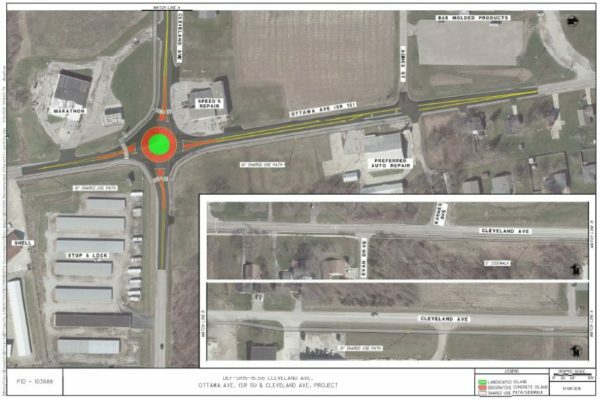 The public is invited to attend a public meeting concerning the proposed improvements for the Ottawa Avenue (SR15) & Cleveland Avenue Improvement Project located in Defiance, Ohio. This project proposes to construct a single lane roundabout at the intersection of Ottawa Avenue at Cleveland Avenue; construct a north-bound left turn lane on Ottawa Avenue to Agnes Street; and construct multi use path facilities within portions of the project limits along Ottawa Avenue and the south side of Cleveland Avenue from Evan Drive to the proposed roundabout at Ottawa Avenue and Cleveland Avenue. These transportation improvements are scheduled for construction in 2021. The public meeting will include a brief presentation starting at 6:00 p.m. followed by an Open House session beginning around 6:30 p.m. (at the conclusion of the presentation). The meeting will run until 8:00 p.m. Throughout the open house, representatives from the City of Defiance, and the Mannik & Smith Group, the project consultant, will be available to answer questions.